1 A None No Power Seat 1 A is a standard World Business bulkhead seat, although proximity to the lavatory and galley may be bothersome. There is no floor storage during take-off and landing. 1 B None No Power Seat 1 B is a standard World Business bulkhead seat, although proximity to the lavatory and galley may be bothersome. There is no floor storage during take-off and landing. 1 D None No Power Seat 1 D is a standard World Business bulkhead seat, although proximity to the lavatory and galley may be bothersome. There is no floor storage during take-off and landing. 1 G None No Power Seat 1 G is a standard World Business bulkhead seat, although proximity to the lavatory and galley may be bothersome. There is no floor storage during take-off and landing. 1 H None No Power Seat 1 H is a standard World Business bulkhead seat, although proximity to the lavatory and galley may be bothersome. There is no floor storage during take-off and landing. 1 J None No Power Seat 1 J is a standard World Business bulkhead seat, although proximity to the lavatory and galley may be bothersome. There is no floor storage during take-off and landing. 10 A None No Power Seat 10 A has additional legroom due to the position of the bulkhead, however proximity to the galley may be bothersome. 10 B None No Power Seat 10 B has additional legroom due to the position of the bulkhead, however proximity to the galley may be bothersome. 10 D None No Power Seat 10 D has additional legroom due to the position of the bulkhead, however proximity to the galley may be bothersome. 10 E None No Power Seat 10 E has additional legroom due to the position of the bulkhead, however proximity to the galley may be bothersome. 10 F None No Power Seat 10 F has additional legroom due to the position of the bulkhead, however proximity to the galley may be bothersome. 10 G None No Power Seat 10 G has additional legroom due to the position of the bulkhead, however proximity to the galley may be bothersome. 10 H None No Power Seat 10 H has additional legroom due to the position of the bulkhead, however proximity to the galley may be bothersome. 10 J None No Power Seat 10 J has additional legroom due to the position of the bulkhead, however proximity to the galley may be bothersome. 11 A None No Power Seat 11 A is a standard Economy Comfort Class seat. 11 B None No Power Seat 11 B is a standard Economy Comfort Class seat. 11 D None No Power Seat 11 D is a standard Economy Comfort Class seat. 11 E None No Power Seat 11 E is a standard Economy Comfort Class seat. 11 F None No Power Seat 11 F is a standard Economy Comfort Class seat. 11 G None No Power Seat 11 G is a standard Economy Comfort Class seat. 11 H None No Power Seat 11 H is a standard Economy Comfort Class seat. 11 J None No Power Seat 11 J is a standard Economy Comfort Class seat. 12 A None No Power Seat 12 A is a standard Economy Comfort Class seat. 12 B None No Power Seat 12 B is a standard Economy Comfort Class seat. 12 D None No Power Seat 12 D is a standard Economy Comfort Class seat. 12 E None No Power Seat 12 E is a standard Economy Comfort Class seat. 12 F None No Power Seat 12 F is a standard Economy Comfort Class seat. 12 G None No Power Seat 12 G is a standard Economy Comfort Class seat. 12 H None No Power Seat 12 H is a standard Economy Comfort Class seat. 12 J None No Power Seat 12 J is a standard Economy Comfort Class seat. 14 A None No Power Seat 14 A is a standard Economy Comfort Class seat. 14 B None No Power Seat 14 B is a standard Economy Comfort Class seat. 14 D None No Power Seat 14 D is a standard Economy Comfort Class seat. 14 E None No Power Seat 14 E is a standard Economy Comfort Class seat. 14 F None No Power Seat 14 F is a standard Economy Comfort Class seat. 14 G None No Power Seat 14 G is a standard Economy Comfort Class seat. 14 H None No Power Seat 14 H is a standard Economy Comfort Class seat. 14 J None No Power Seat 14 J is a standard Economy Comfort Class seat. 15 A None No Power Seat 15 A is a standard Economy Comfort Class seat. 15 B None No Power Seat 15 B is a standard Economy Comfort Class seat. 15 D None No Power Seat 15 D is a standard Economy Comfort Class seat. 15 E None No Power Seat 15 E is a standard Economy Comfort Class seat. 15 F None No Power Seat 15 F is a standard Economy Comfort Class seat. 15 G None No Power Seat 15 G is a standard Economy Comfort Class seat. 15 H None No Power Seat 15 H is a standard Economy Comfort Class seat. 15 J None No Power Seat 15 J is a standard Economy Comfort Class seat. 2 A None No Power Seat 2 A is a standard World Business Class seat. 2 B None No Power Seat 2 B is a standard World Business Class seat. 2 D None No Power Seat 2 D is a standard World Business Class seat. 2 G None No Power Seat 2 G is a standard World Business Class seat. 2 H None No Power Seat 2 H is a standard World Business Class seat. 2 J None No Power Seat 2 J is a standard World Business Class seat. 28 A None No Power Seat 28 A is a standard Economy seat, although there may be limited recline due to the wall behind this row. Proximity to the lavatories may be bothersome. 28 B None No Power Seat 28 B is a standard Economy seat, although there may be limited recline due to the wall behind this row. Proximity to the lavatories may be bothersome. 28 D None No Power Seat 28 D is a standard Economy seat, although there may be limited recline due to the wall behind this row. Proximity to the lavatories may be bothersome. 28 E None No Power Seat 28 E is a standard Economy seat, although there may be limited recline due to the wall behind this row. Proximity to the lavatories may be bothersome. 28 F None No Power Seat 28 F is a standard Economy seat, although there may be limited recline due to the wall behind this row. Proximity to the lavatories may be bothersome. 28 G None No Power Seat 28 G is a standard Economy seat, although there may be limited recline due to the wall behind this row. Proximity to the lavatories may be bothersome. 28 H None No Power Seat 28 H is a standard Economy seat, although there may be limited recline due to the wall behind this row. Proximity to the lavatories may be bothersome. 28 J None No Power Seat 28 J is a standard Economy seat, although there may be limited recline due to the wall behind this row. Proximity to the lavatories may be bothersome. 3 A None No Power Seat 3 A is a standard World Business Class seat. 3 B None No Power Seat 3 B is a standard World Business Class seat. 3 D None No Power Seat 3 D is a standard World Business Class seat. 3 G None No Power Seat 3 G is a standard World Business Class seat. 3 H None No Power Seat 3 H is a standard World Business Class seat. 3 J None No Power Seat 3 J is a standard World Business Class seat. 30 D None No Power Seat 30 D is a standard bulkhead seat. Proximity to the lavatories may be bothersome. There is no floor storage during take-off and landing. 30 E None No Power Seat 30 E is a standard bulkhead seat. Proximity to the lavatories may be bothersome. There is no floor storage during take-off and landing. 30 F None No Power Seat 30 F is a standard bulkhead seat. Proximity to the lavatories may be bothersome. There is no floor storage during take-off and landing. 30 G None No Power Seat 30 G is a standard bulkhead seat. Proximity to the lavatories may be bothersome. There is no floor storage during take-off and landing. 30 H None No Power Seat 30 H has extra legroom due to the exit row, although proximity to the lavatory may be bothersome. There is no floor storage during take-off and landing. 30 J None No Power Seat 30 J has extra legroom due to the exit row, although proximity to the lavatory may be bothersome. There is no floor storage during take-off and landing. 31 A None No Power Seat 31 A has plenty of extra legroom as the seat in row 30 is missing. There is no floor storage for this seat during take-off and landing. 31 B None No Power Seat 31 B has plenty of extra legroom as the seat in row 30 is missing. There is no floor storage for this seat during take-off and landing. 4 A None No Power Seat 4 A is a standard World Business Class seat. 4 B None No Power Seat 4 B is a standard World Business Class seat. 4 D None No Power Seat 4 D is a standard World Business Class seat. 4 G None No Power Seat 4 G is a standard World Business Class seat. 4 H None No Power Seat 4 H is a standard World Business Class seat. 4 J None No Power Seat 4 J is a standard World Business Class seat. 41 G None No Power Seat 41 G juts into the aisle and is often bumped by service carts and passengers during flight. 42 D None No Power Seat 42 D juts into the aisle and is often bumped by service carts and passengers during flight. 44 A None No Power Seat 44 A is in the last row of Economy Class and may have limited recline due to the wall behind. Proximity to the lavatory and galley may be bothersome. 44 B None No Power Seat 44 B is in the last row of Economy Class and may have limited recline due to the wall behind. Proximity to the lavatory and galley may be bothersome. 44 D None No Power Seat 44 D is a standard Economy seat, although proximity to the lavatory and galley may be bothersome. 44 G None No Power Seat 44 G is a standard Economy seat, although proximity to the lavatory and galley may be bothersome. 44 H None No Power Seat 44 H is in the last row of Economy Class and may have limited recline due to the wall behind. Proximity to the lavatory and galley may be bothersome. 44 J None No Power Seat 44 J is in the last row of Economy Class and may have limited recline due to the wall behind. Proximity to the lavatory and galley may be bothersome. 45 D None No Power Seat 45 D is in the last row of Economy Class and may have limited recline due to the wall behind. Proximity to the lavatory and galley may be bothersome. 45 E None No Power Seat 45 E is in the last row of Economy Class and may have limited recline due to the wall behind. Proximity to the lavatory and galley may be bothersome. 45 G None No Power Seat 45 G is in the last row of Economy Class and may have limited recline due to the wall behind. Proximity to the lavatory and galley may be bothersome. 5 A None No Power Seat 5 A is a standard World Business Class seat, although close proximity to the galley may be bothersome. 5 B None No Power Seat 5 B is a standard World Business Class seat, although close proximity to the galley may be bothersome. 5 D None No Power Seat 5 D is a standard World Business Class seat, although close proximity to the galley may be bothersome. 5 G None No Power Seat 5 G is a standard World Business Class seat, although close proximity to the galley may be bothersome. 5 H None No Power Seat 5 H is a standard World Business Class seat, although close proximity to the galley may be bothersome. 5 J None No Power Seat 5 J is a standard World Business Class seat, although close proximity to the galley may be bothersome. Passengers aboard this aircraft can connect their laptop or other electronic equipment to the power supply located in all seats on this plane. They can also send and receive e-mails and text messages through the entertainment system. 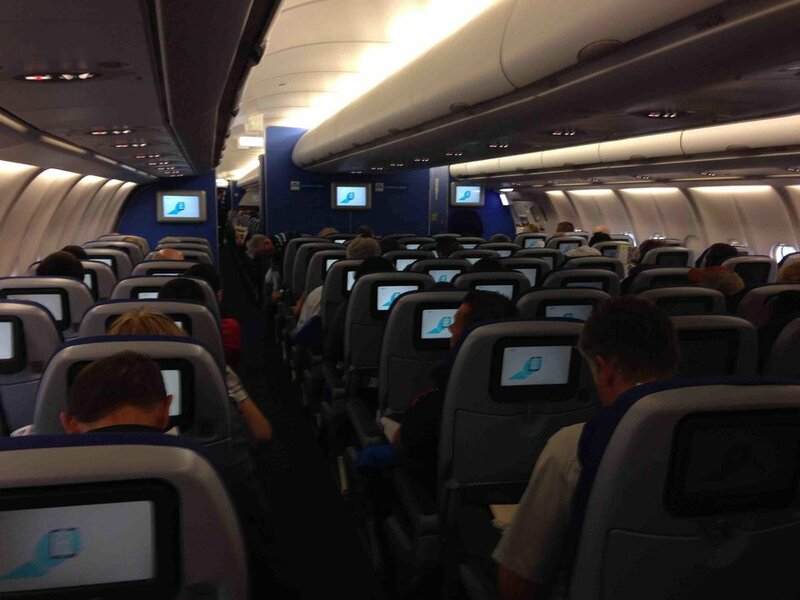 KLM flies the Airbus A330-300 (333) with 292 seats in a two-class configuration of World Business and Economy. Doing on behalf of my husband, who hates travelling long-haul with KLM, because the seats are *not* flat, but have a 10% slope. So he finds it frustrating, uncomfortable and cannot sleep, ever. This is the best economy seat on my favorite type of plane KLs A333. I always go for this seat, if available because KL tends to reserve those seats for people with little (crying) babies. (C and up this time) If you do not bother crying babies, go for this seat but do bring your own proper headset if ou find crying babies bothersome. I had it on my outbound flight. Crew was giving me extra attention because in 31B was a person with a minor disability I kept a little eye on. The bulkhead provides a comfy surrounding with privacy. The screen and the treatable are in the armrest but that is not bothersome for the seat width because unlike KLs Boeing fleet they do not out an extra seat in a row of their Airbus fleet . I am 5'6 and could stretch my legs to the fullest. At the inbound flight I sat in 32A, ok but the mediabox under the A and B seats are bothersome. at 31A this is no problem. The aisle is wide enough to let two people pass so these are not bothersome. the restroom is two steps away and the row is placed a bit behind the next row (c and up). Do not bother economy plus if you can this seat, economy plus at KL is fake and nothing else that economy with a bit more legroom; if you want better service go for business. 31a must be one of the best true economy seats I've ever flown in. 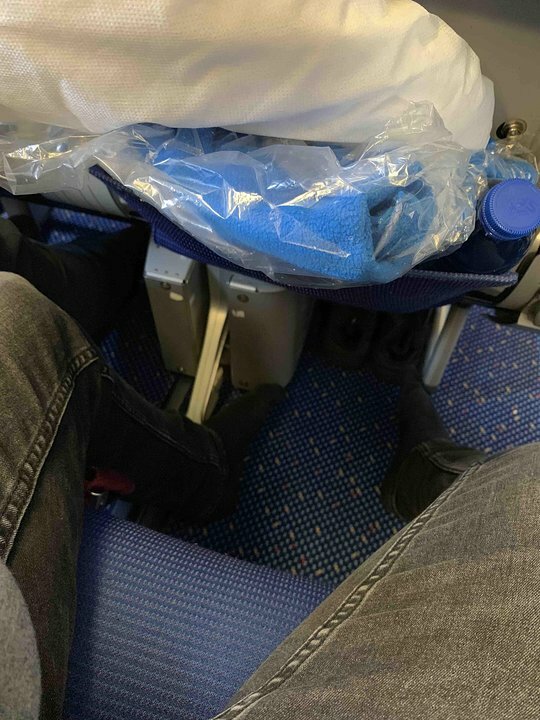 KLM don't class this as a premium seat, and state it has the same leg room as all other seats. I flew in economy plus 2 weeks previously and was unimpressed. 31a is now my goto seat on the route. Obviously not floor storage and TV in arm rest but it really isn't an issue. I'm about 6ft/182cm and was able to comfortably use the bulkhead as a foot rest. Seat 31A/B have more legroom than the middle part of row 31, but seat 31B is very narrow. The holder for AVOD remote control, which is made from metal, considerably reducing seat width. Try to choose 31A. Also 31A/B are not as cold as 31H/J due to the bulkhead in front. The seats in business class are excellent. They adjust to suit any body shape, afford ample legroom, and recline almost flat. They are infinitely more comfortable than those narrow, claustrophobic "pods" that are so common nowadays. Perfect seat, though a bit narrow. Plenty of legroom. Galley was not bothersome. I also prefer the location of the screen for the inflight entertainment. It is not in the seat in front of you, but stowed sideways. It is better adjustable then the one in the seat. We had seats 1D, 1G, 1H, 1J on this A330 (although originally scheduled as their 747-400 (which I have flown before and LOVE the first row (although only 3 across))). The issue is the traffic to the bathrooms and the use of a simple curtain to shield the lights of the galley from waking you. I also would rate the seats as 'Red' and avoid at all costs! 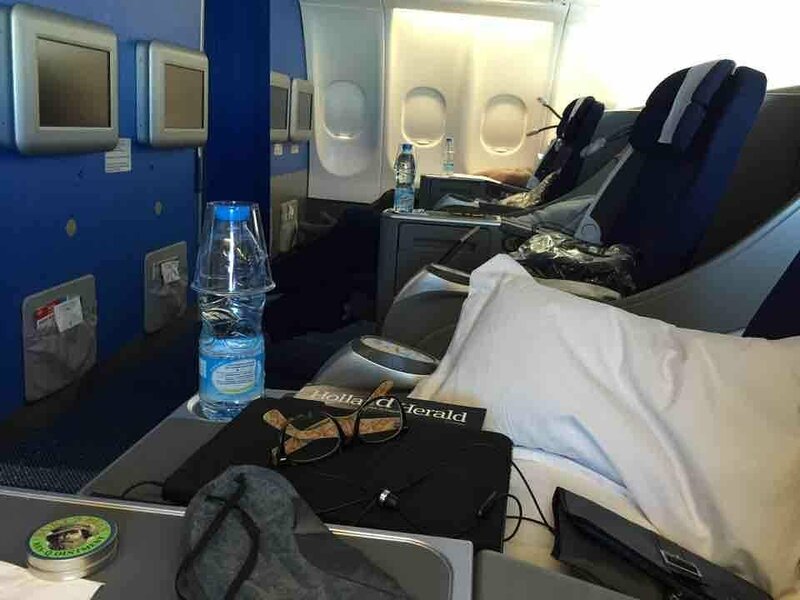 This is the first seat row behind Economy Premium. It had the same pitch as Economy Premium, lots of legroom. I would put 1D and 1E as red seats; as not only do they have troublesome proximity to toilets and food preparation areas in terms of noise; but due to poor signage/design, other passengers also mistakenly walk in front of your seat (and TV) to get to the opposite toilet, rather than go round the front of the plane. Upgraded to these business class seats when checking in. 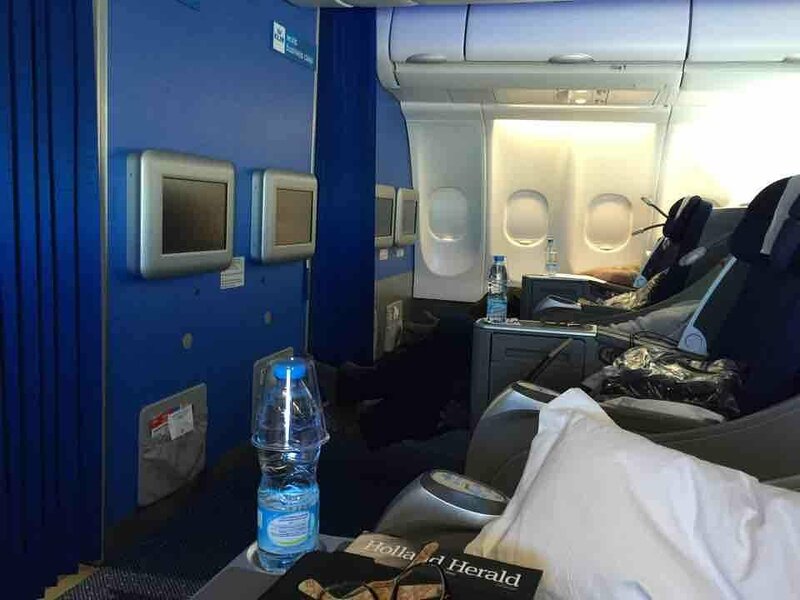 Very good experience, seats recline all the way and i was able to sleep, first time ever. Staff was great as was food and the noise reducing headphones. 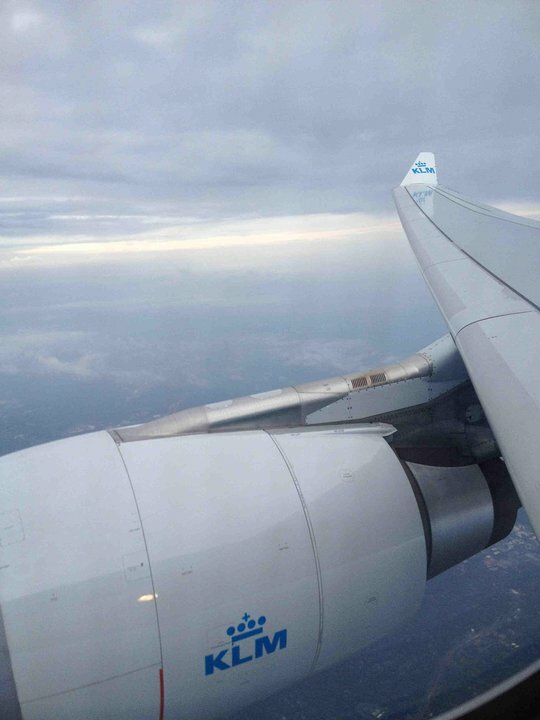 KLM flies 1 versions of Airbus A330-300.